WASHINGTON/ANKARA (Reuters) - President Donald Trump said on Thursday he presumes missing Saudi journalist Jamal Khashoggi is dead and that the U.S. response to Saudi Arabia will likely be "very severe" but that he still wanted to get to the bottom of what exactly happened. "It certainly looks that way to me. It's very sad," Trump told reporters before boarding Air Force One on a political trip. In an interview with the New York Times on Thursday, Trump based his acknowledgment that Khashoggi was dead on intelligence reports. In the New York Times interview, Trump also expressed confidence in intelligence reports that suggest a high-level Saudi role in the suspected killing of Khashoggi. Trump said, however, it was still "a little bit early" to draw definitive conclusions about who may have been behind it. Trump said he was waiting for the results so that "we can get to the bottom of this very soon" and that he would be making a statement about it at some point. Asked what would be the consequences for Saudi Arabia, Trump said: "Well, it'll have to be very severe. I mean, it's bad, bad stuff. But we'll see what happens." The United States considers Riyadh a linchpin in efforts to contain Iran's regional influence and a key global oil source, and Trump has shown no inclination to mete out harsh punishment to the Saudis. The United States and other Western nations are in a dilemma of how to respond because of lucrative business ties, including weapons sales to Riyadh. Referring to the Saudis, Pompeo said he told Trump that when the Saudi investigation was completed "we can make decisions about how - or if - the United States should respond to the incident surrounding Mr. Khashoggi." "I think it's important for us all to remember, too - we have a long, since 1932, a long strategic relationship with the Kingdom of Saudi Arabia," Pompeo told reporters, also calling Saudi Arabia "an important counterterrorism partner." A U.S. government source said that U.S. intelligence agencies are increasingly convinced of the crown prince's culpability in the operation against Khashoggi, which they believe resulted in his death. "This incident is unacceptable and clearly they have to answer questions specifically regarding this incident," Goldman Sachs CEO David Solomon told CNBC. How Western allies deal with Riyadh will hinge on the extent to which they believe responsibility for Khashoggi's disappearance lies with Prince Mohammed and the Saudi authorities. Trump previously speculated without providing evidence that "rogue killers" could be responsible. 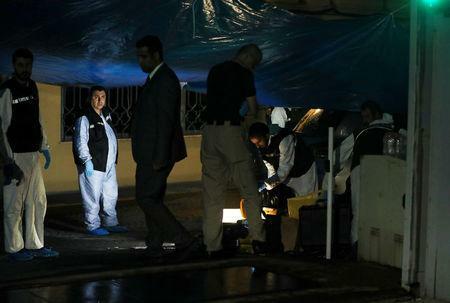 After investigations at the Saudi consulate and the consul's residence, Turkish authorities have widened the geographic focus of the search, the senior Turkish officials said. Investigators tracked the routes and stops of cars that left those two places on Oct. 2, the officials said. Khashoggi's killers may have dumped his remains in Belgrad Forest adjacent to Istanbul, and at a rural location near the city of Yalova, a 90-kilometre (55 mile) drive south of Istanbul, the officials said. "The investigations led to some suspicion that his remains may be in the city of Yalova and the Belgrad forest, police have been searching these areas," one of the officials said, speaking on condition of anonymity. A "farm house or villa" may have been used for the disposal of remains, the official said.